Since I began my archival studies degree, I have been keen to get some hands-on experience. This summer, the City of Vancouver Archives took me in for a three-month internship. On my first day, archivist Chak Yung introduced me to fourteen boxes of records from City Stage Theatre, which I would process over the next month. I was fortunate to be assigned a fonds with a diversity of materials. The City Stage fonds includes textual records (such as correspondence and play scripts), newspaper clippings, promotional materials (such as colorful handbills, posters, and programs for plays), stage plans, Playhouse magazines, reel-to-reel audio tapes, and approximately 500 (mostly professional black and white) photographs. A sample from the City Stage Theatre fonds – Playboard magazines, reel-to-reel audio tapes, box office reports, and sheet music from a theatrical production. Photograph by Mel Leverich. It was a pleasure to be assigned to the City Stage Theatre fonds, as it documents a fascinating part of Vancouver’s theatre history. City Stage Theatre was a professional theatre company based in Vancouver that operated from 1972-1986 and was founded and managed by Ray Michal, a passionate advocate for theatre in this city. In its early days, the theatre was located in a converted donut shop at 591 Howe Street where they offered short shows over the noon hour for the downtown business crowd and local residents. As Michal explained in an interview, “we wanted to break some of the preconceived notions of what going to the theatre was all about … You could just walk up to the shop, and buy an hours’ worth of theatre. Just like you could walk up to the deli and get yourself a corned beef sandwich” (AM1560-S6-F50). In 1976, City Stage relocated to 751 Thurlow Street where they constructed a 150-seat theatre. They expanded capacity to produce full-length plays, present evening shows, and tour productions. City Stage’s aim was to produce good-quality contemporary theatre that was relevant and accessible to their audience. They produced comedies, musical theatre, and more earnest plays with a political or ethical angle. City Stage’s productions included provocative plays such as David Mamet’s Sexual Perversity in Chicago and Christopher Durang’s Sister Mary Ignatius Explains It All For You. They hosted Charles Gray and the Black Arts Theatre’s production of Ntozake Shange’s experimental choreopoem For Colored Girls Who Have Considered Suicide When the Rainbow is Enuf, and they rented the theatre space to the Vancouver TheatreSports League in its early days. One of their more popular shows, Piaf, Her Songs, Her Loves, starred Joëlle Rabu, who made her acting and singing debut in her role as Edith Piaf. 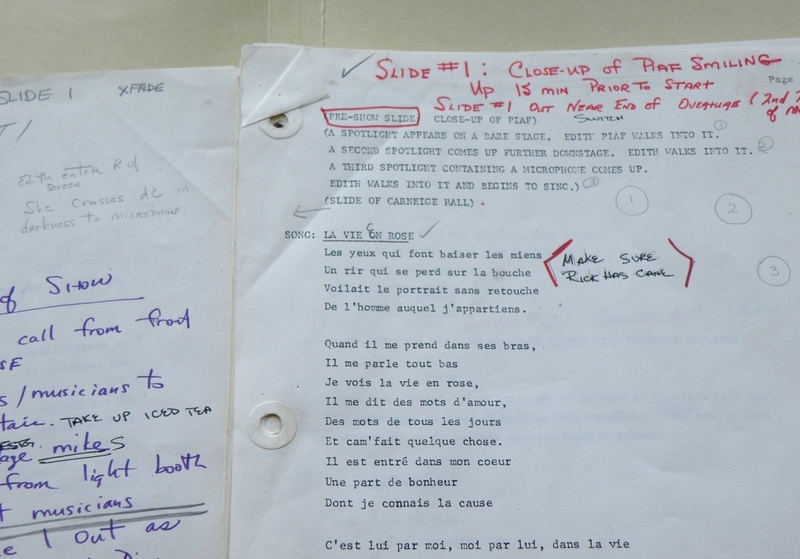 A close-up of a page from the script of the City Stage production “Piaf, Her Songs, Her Loves”. Photograph by Cristen Polley. As I described and re-housed the City Stage fonds, its story was re-told to me through the records. The correspondence and other textual records reveal City Stage’s commitment to affordable professional theatre in the heart of the city, the success of their productions, as well as their struggle to maintain a non-profit theatre in downtown Vancouver. The photographs depict actors on stage and include headshots. The promotional materials are striking examples of print design in the 1970s and early 1980s. To preserve the records over time, I re-housed them in acid-free folders and Hollinger boxes. Some of the material required extra care. I housed the negative photographs in frozen storage and filed the photographs in individual acid-free envelopes that have passed the PAT (Photographic Activity Test). The newspaper clippings were separated from adjacent records with acid-free folders to prevent cross-contamination. I opened folded stage plans and placed them in flat oversize storage. 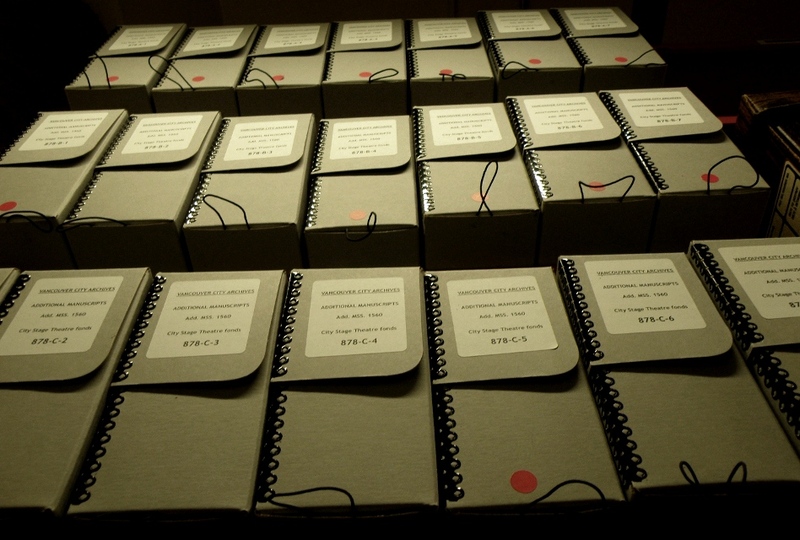 Dramatic records – City Stage Theatre records stored in acid-free folders inside Hollinger boxes. Photograph by Cristen Polley. After the City Stage records were described and re-housed, my fellow intern Mel and I spent a week in the conservation lab with Sue Bigelow. I cleaned, humidified, and flattened a Townley and Matheson architectural plan that had been wrapped tightly on a wooden dowel. The humidifying chamber was like a gentle spa treatment for the rolled maps, which flattened nicely after humidification and were then placed in flat oversize storage. In the lab, I had the chance to clean surface dirt from fragile lantern slides and glass plate negatives, my favorite type of photographs. I also spent part of a day with volunteer Kathy Kinakin, who taught us how to make a clam-shell box with a sink mat to protect large glass plate negatives in storage. In the lab, I performed a Beilstein test on some of the plastic sleeves that enclose the City Stage Theatre press clippings. The test was to determine if the plastic contains chloride, which is an additive in plastic that damages the records as it degrades over time. A green flame looks flashy but is positive for chloride. After our time in the lab, Mel and I worked together under the supervision of Glenn Dingwall for three weeks to update the authority records for the City of Vancouver’s Community Services and Planning and Development Services Groups. In order to create a complete picture of the evolution of these administrative bodies, Mel and I consulted the City’s organizational charts, City Council meetings minutes, and records created by the departments that are held in the archives. For one week during my internship, Jill Teasley and Megan Schlase taught me all about the resources that are available to researchers in the reading room and online. I responded to research requests and spent a busy Friday working at the front desk, signing in new researchers and retrieving material from the stacks. Digitization is an important component of current and future archival work, as it protects the records from repetitive handling and enables greater public access. To learn more about the process, I spent part of a day with Mandy Roddick, the digitization technician who taught me how she digitizes photographs, textual records (Council meeting minutes), and oversize material (maps). Towards the end of my internship, I got to fire up the Studer, a handsome reel-to-reel audio playback machine, so that I could listen to and appraise City Stage’s audio recordings. I loved winding the tapes through the Studer, watching the wheels spin and hearing disco music, vintage advertisements, and haunting sound effects crackle through the speakers. 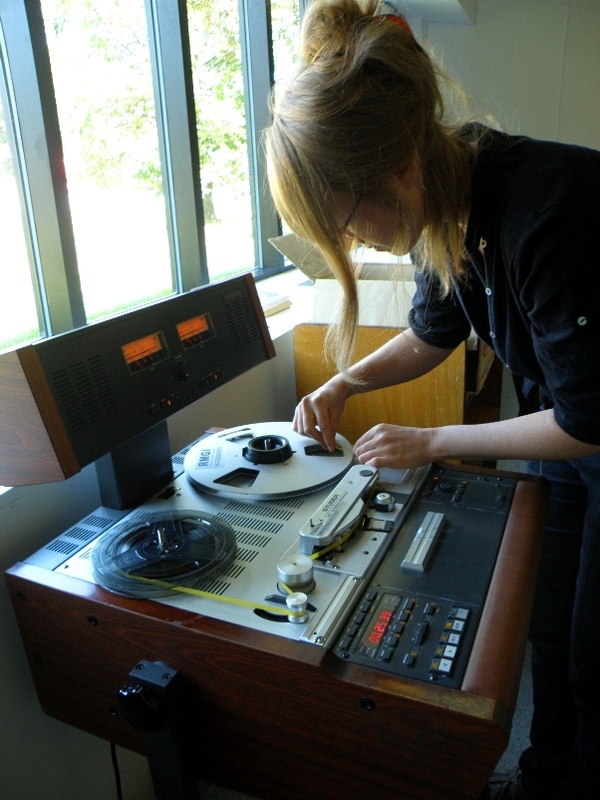 Loading up the Studer with a reel-to-reel audio tape. Photograph by Mel Leverich. Many of the tapes were spliced together to create a soundtrack for plays. Some of the original splices were quite fragile and would snap when played, so I gained experience splicing together broken tape on the Studer’s handy splicing block. 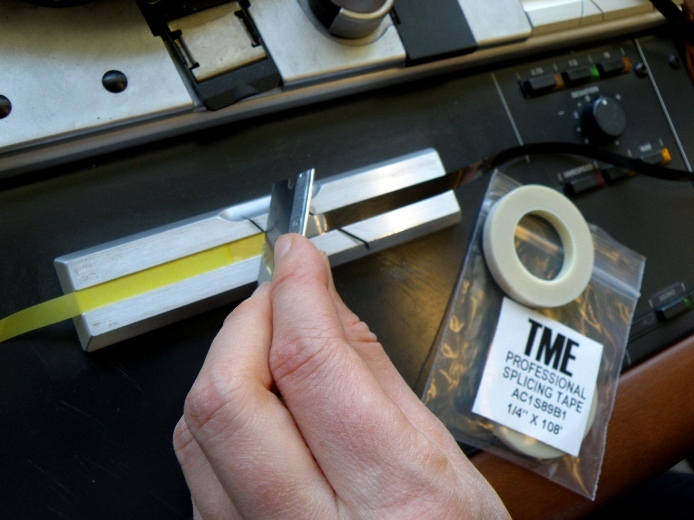 Repairing an original splice in a reel-to-reel audio tape. Photograph by Mel Leverich. My summer internship at the archives began in late April during the last of the spring rains and ended in early August as the wild blackberries started to ripen. Over those three months, I am grateful to have worked side by side with Mel, a wonderful fellow archivist in training. 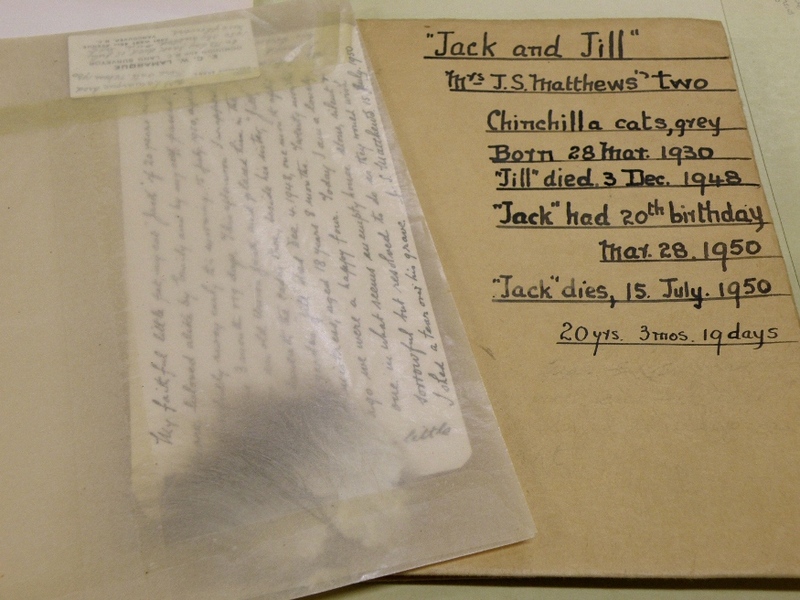 On our breaks, we watched baby eagles from the nest nearby and tracked down Major Matthews’ cat’s fur in the stacks. I am also very grateful to City Archivist Heather Gordon and the entire staff who provided me with just the right balance of professional guidance and independence that I need to make my way as an archivist. My favorite record in the archives – a tuft of Jack’s hair. Jack was one of Major Matthews’ beloved cats. Photograph by Mel Leverich. Editor’s note: Cristen is a Dual Master’s of Archival Studies/Library and Information Studies candidate at the School of Library, Archival and Information Studies (University of British Columbia). This entry was posted in Archivy, People and tagged City Stage, Students. Bookmark the permalink. I read this with great interest as I was responsible for transferring the archives from Ray Michal’s widow to City Archives, some 18 months ago. I also saw most of Citystage’s shows. Is my Canadian Theatre Review, Winter 1977, article on Citystage in the archive?! You credit Michal as founder. George Plawski was in fact co-founder (in the early weeks); he directed and brought experience of lunchtime theatre in Britain. I an seeing him this week. There are some publicity materials in the CityStage fonds (described at the file level) which might include the article. The records won’t be available for access, though, until sometime in the fall after the draft descriptions have been checked and uploaded to the online database. We’ll amend the information about the founder and make sure that appears in the administrative history. Wonderful stuff to read. Ray gave me my first job in professional theatre in early 1980. I was only 17 when he handed me the keys and said that lighting and sound were now my responsibilities. I actually had to skip school in the afternoons to make it to work for matinees. Many great shows and memories. I vividly remember the first Theatre Sports night when I had to bribe street people with hamburgers from McDonald’s just to fill the seats. What a great story, Jim. Thank you for sharing it!